I have been seeing different paella recipes all over the food blogging sphere but don’t ever have the ingredients handy, so again I was inclined to improvise. Here is a very simplified and inexpensive version of a very rich recipe. Most paella recipes call for saffron, but I haven’t bought any since I exhausted my supply from Spain that I received as a gift, so this version is sadly saffronless. The flavor is different from the traditional paella, but still quite good in its own way. Heat oil in a large pot or wok and saute half of the garlic and onions until fragrant. Add the rice and saute in the oil until the edges are slightly browned and all grains are covered in oil. Add the tomatoes and mixed vegetables and cook for another minute. Add the chicken broth and salt & pepper to taste, cover and cook until rice is tender. While the rice is cooking, in another pot/skillet heat the olive oil and saute the remaining garlic until fragrant but not browned. Add the shrimps and saute quickly just until the color turns opaque. Don’t overcook. Take shrimps out and reserve. In the same pan, add the wine to deglaze, then add the mussels. Cover and steam just until shells open. Remove from heat. Remove the meat from half of the shells, leaving the other half intact. 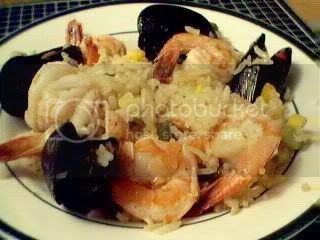 When the rice is tender, stir, and add the shrimps and mussels. Transfer to an oven proof dish, and put under the broiler for 10 minutes. Watch to make sure it doesn’t burn. Serve. you know what i use in the absence of saffron is anatto powder or achuete. i just mix it with water and put in the rice while cooking. i likewise put all the veggies (peas, green/red sweet peppers) on top of the steamed rice to cook, in that way it doesn’t become mushy. Hi Maria! Thanks, I hope you do try it, and try Karen’s suggestion below if you don’t have saffron. Oh this looks so good. The shrimps look so tempting!! In Pampanga we have bringhe, an adaptation of paella Valenciana. Turmeric is used to give the rice a yellow-greenish hue. Mmmmm wow Ive always wanted to make paella… im gonna try yours!! An I am gonna link you as your blog looks so tasty. And yes I looked at your daughters site its so cute lol… so i guess ellie has a new blogger friend now cool!! I and David also love cooking dang!! Again lovely site.. i will come back for more!!! 🙂 Take care!